Born to an aristocratic family, Algernon Sidney became one of the leading republican theorists of the late 17th century whose works exerted a considerable influence on 18th century America. He served in the army during the 1640s and 1650s, sat in Parliament where he voted against the execution of the king, lived in exile in Holland and France for much of the Restoration (of the Stuart monarchy after 1660), and in the late 1670s and early 1680s became involved in various plots against the Crown which led to arrest and execution for high treason. His major and best known work is his Discourses concerning Government (written 1679-1683, published 1698) which Sidney wrote to refute Sir Robert Filmer’s (1588-1653) patriarchal theory of the monarchy, Patriarcha, or the Natural Power of Kings, which had appeared in 1680. Filmer’s work also prompted John Locke to write part of the Two Treatises of Government so it is be doubly famous for having prompted into being two classics of the republican commonwealthman tradition which was to so influence the 18th century, especially those in America who were challenging the right of the British king to rule over them. Sidney’s criticisms of the arbitrary and despotic powers of the restored Stuart monarchy so inflamed their supporters that Sidney was singled out for persecution and its was with delight that they found in his rooms an unpublished manuscript of his Discourses which they used as evidence of treason against him, the judge arguing that “scribere est agere” (to write is to act - i.e that writing in favour of an act is the same as carrying out that act). Sidney lost the case and was duly beheaded, but was spared the indignity of having his body drawn and quartered. The Discourses were published some tears after his execution (1698) and again by Thomas Hollis in 1762. Copies of Sidney's work were widely circulated and read in the American colonies thus making it one of the key texts for understanding the thinking of the American revolutionaries. Algernon Sydney second son of Robert Earl of Leicester. Colonel of a regiment of horse. One of the Council of State and Commissioner to mediate a peace between Sweden and Denmark. Beheaded afterwards unjustly for high treason Dec. VII MDCLXXXIII. Drawn and etched MDCCLX by I.B. Cipriani a Florentine from a proof impression of a seal ingraved by Thomas Simon in the possession of Thomas Hollis of Lincoln's Inn F.R. (Fellow of the Royal Society) and A. SS (Member of the Society of Antiquaries). "manus haec inimica tyrannis, ense petit placidam sub libertate quietem". Though Monsieur Terlon understood not a word of Latin he was told by others the meaning of that sentence which he considered as a libel upon the French government and upon such as was then setting up in Denmarck by French assistance or example. Lord Molesworth's preface to his account of Denmark. Col. Sydney bore this only motto without figure on the parliament side during the civil wars. Commentary: The "left facing" Sidney image is different from the "right facing" image in three respects: the direction Sidney is facing; the length of the written information below the image; and the line of text at the bottom which explains the meaning of the banner Sidney is holding over his shoulder. The "left facing" Sidney has two additional paragraphs of text (the top two) which provide a brief bio of Sidney and a description of the origin of the image and the name of the artist. The "left facing" image was probably used as a stand alone picture postcard which was sent to friends of the publisher Thomas Hollis, possibly in the hope that the recipients might buy his edition of Sidney's Works (1762). The extra text had to be inserted after the image was drawn, thus intruding slightly into the text. The "right facing" image was used as the frontispiece of this edtion and so had no use for the top two paragraphs of texts as this information was contained elsewhere in the book. The motto Sidney wrote for the King of Denmark can be translated as "this hand, hostile to tyrants, seeks with the sword a quiet peace under liberty". The motto was adopted by the State of Massachusstts as its official motto. The anecdote comes from Molesworth's An Account of Denmark, as it was in the Year 1692. The Third Edition Corrected. (London: Timothy Goodwin, 1694). Preface, pp. xxxiv-xxxv. 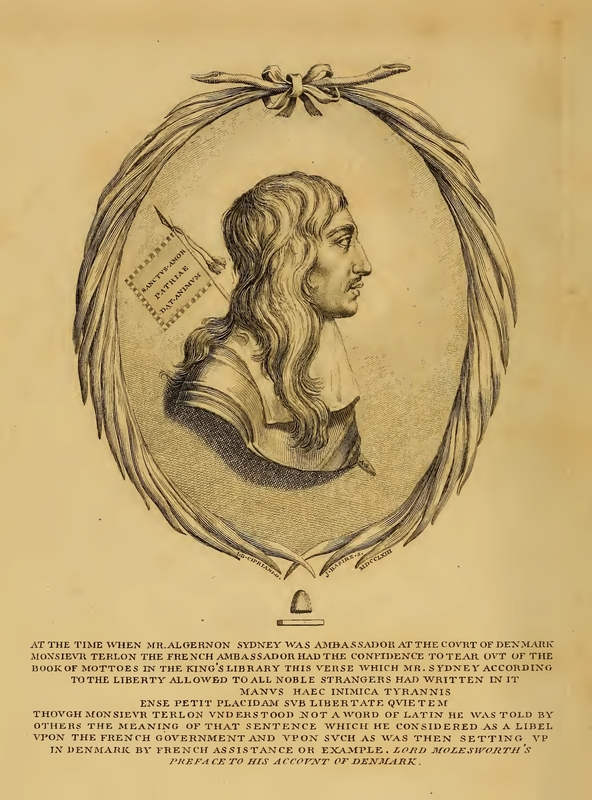 This image was designed by Thomas Hollis and appeared as the frontispiece of his 1762 edition of Algernon Sidney's Discourses concerning Government (1698) which was one of the most important works on republicanism to appear in the 17th century and which had a profound effect on the thinking of the American colonists during the American Revolution. It shows a long-haired, rather aristocratic Sidney dressed in the army uniform he wore during the 1640s. Over his shoulder he carries a banner with the Latin motto "Sanctus amor patriae dat animum" (the sacred love of the fatherland inspires). He turned against the revolution after Oliver Cromwell was appointed Lord Protector and went into self-imposed exile when the Stuart monarchy was restored in 1660. While he was Ambassador to Denmark in 1659 he wrote a provocative Latin motto in the King's visitors book which is included in the text above: "manus haec inimica tyrannis, ense petit placidam sub libertate quietem" which can be translated as "this hand, hostile to tyrants, seeks with the sword a quiet peace under liberty". This motto was adopted by the State of Massachusetts in 1775 as its official motto in recognition of the important role Sidney's ideas played in the formation of the American republic. Commentary: This image appeared as the frontispiece to the Thomas Hollis' edition of Sidney's Discourses concerning Government (London, 1762). The motto Sidney wrote for the King of Denmark can be translated as "this hand, hostile to tyrants, seeks with the sword a quiet peace under liberty". The motto was adopted by the State of Massachusetts as its official motto in 1775. The anecdote comes from Molesworth's An Account of Denmark, as it was in the Year 1692. The Third Edition Corrected. (London: Timothy Goodwin, 1694). Preface, pp. xxxiv-xxxv.